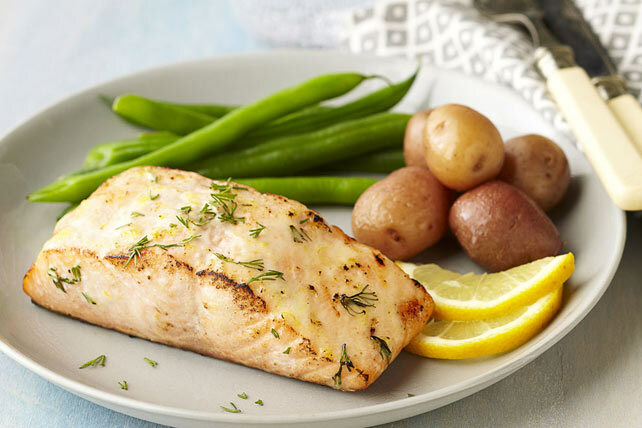 MIRACLE WHIP seals in all the flavour in this quick and easy grilled fish recipe. Mix Miracle Whip, lemon zest, juice and 1 Tbsp. dill until blended. Reserve half. Place fish, skin-sides down, on barbecue grate; brush with remaining Miracle Whip mixture. Grill 10 min. or until fish flakes easily with fork, brushing with reserved Miracle Whip mixture after 5 min. Transfer fish to plate; sprinkle with remaining dill. Garnish with lemon slices just before serving. Prepare using your family's favourite white fish fillets, such as tilapia, halibut or cod.